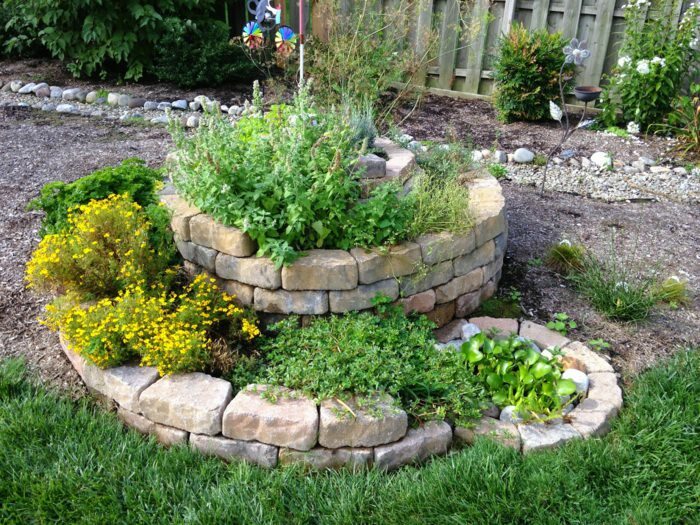 Learn how to build a herb spiral in this article. A spiral herb garden is used for growing different herbs in a small space. With it, you can make a perfect use of your vertical space in an arranged manner. A herb spiral is basically a small herb garden. It is three-dimensional and have beds in a confined, sloppy space of spiral shape, which can be used to grow various herbs. The top area of the spiral receives the full sun and has superior drainage, therefore, herbs that like exposure to the sun and good drainage are planted there. The bottom area of the spiral is suitable to grow herbs that require moist soil and less sun. 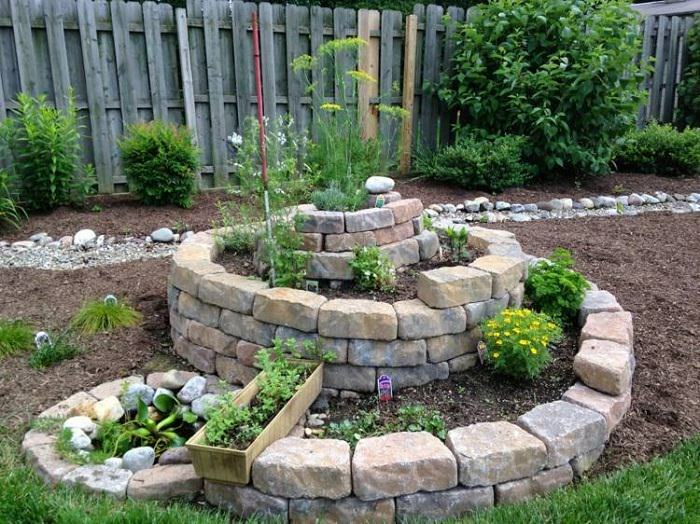 Herb spiral has spirally upward walls that are made of natural stones or bricks. The spiral shape is enlarged in contrast to the raised bed, the bed area has sufficient space to grow herbs and there are several zones with different soil characteristics and exposure to the sun. The walls of herb spiral store solar heat and pass it at night back to the plant. Gabion walls look very attractive and are suitable for spiral herb gardens, too. At the foot of the herb spiral you can even make a mini pond, which will retain the moisture in the lower area, or if you want, you can create a wetland where you can grow plants that love saturated soil. Making a herb spiral is relatively cheap or almost free. It utilizes vertical space, which means you can grow more plants in small space. It also provides microclimates to different plants that mean you can grow more variety of plants. You can also make it on a concrete floor in your urban space. 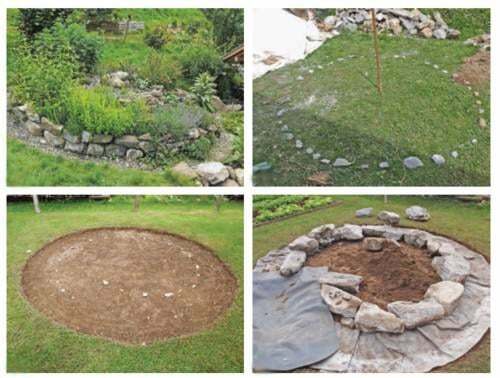 Build a herb spiral in a spot that receives at least 5 hours of sunlight daily. A sunny spot is good, but if you live in tropics choose an area that receives shade in the afternoon. You can also make herb spiral on a rooftop garden or on a large balcony or terrace. • Working Tools: Spade, shovel, wheelbarrow, a stick, a rope and a measurement tape. An 80-100 cm (0.8-1 m) high herb spiral should have a minimum diameter of 1.5-2 m.
1. Decide where on the ground you’ll make a herb spiral. Plant a pole exactly at the center of that area and with the help of the measurement tape and rope, make a circle with a stick and then mark it with limestone. 2. Now erode the topsoil with the help of a shovel or spade to level the spot, also remove weeds and other debris. 3. If you want to create a pond or wetland at the foot of the spiral dig the soil more deeply at that point. 4. Before you lay the stones to make the wall, cover the excavation for the future pond with pond liner and around the spiral and its path with geotextile to prevent the weeds. If you don’t want to use geotextile, lay the cardboards. You can skip this step if you want. 5. 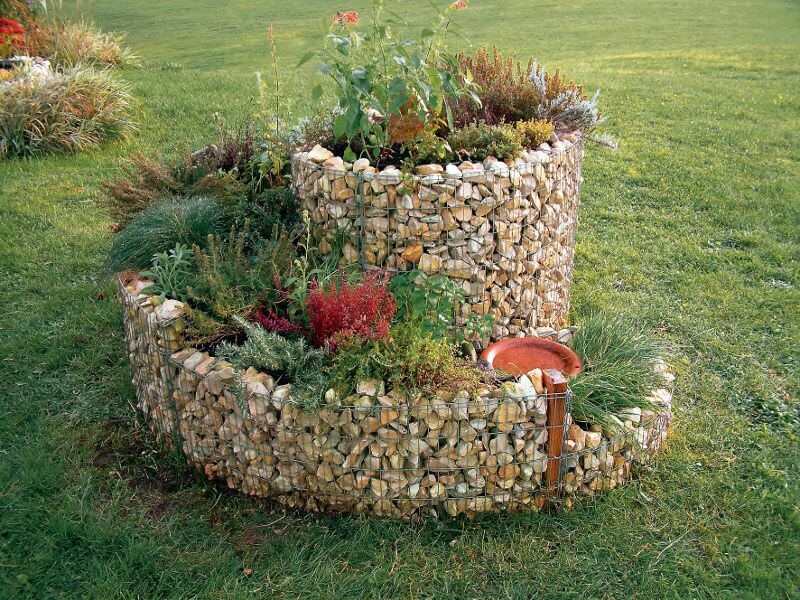 Use the larger stones for the very bottom file of the spiral wall and smaller stones for the top. Keep the top layer of stones slightly inclined towards the interior. 6. Raise the row of layered stones and spiral up to a height of about 0.80 to 1 m. Always fill in the gaps with gravel or rubble. Also, at the center of the spiral, which is deepest, you can fill half of its depth with rubble or gravel. 7. Space for the plants to grow between the spirals should be, according to the amplitude of the spiral, ideally 30 to 50 cm. 8. Add a thin layer of crushed stone, gravel, wood chips or other materials in the base of your spiral bed where you’ll grow plants to cover the gap and improve drainage. At last, fill the spiral with soil and aged manure or compost. Once done, your spiral herb garden is ready for planting. 9. 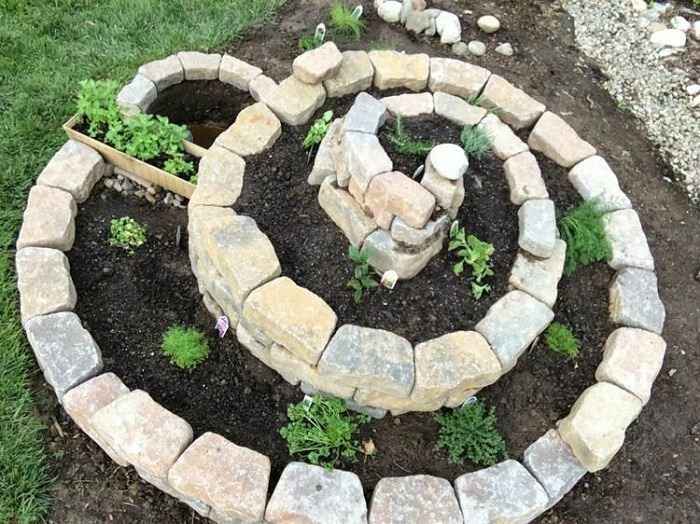 In the case of very large spirals, it could be difficult to collect herbs from the center without stepping on the bed so it is a good idea to lay the stones as footholds. For stability, it is important that the stones are placed with the smooth side down, and they are arranged staggered to avoid creating continuous joints. Here we have provided you a plan for a small Mediterranean spiral herb garden: For this, you will need a warm and sunny place. You can easily adjust your choice of herbs according to your climate and amount of sun your herb spiral may receive. Planting Example: 1 Thyme, 2 Oregano (Origanum vulgare), 3 Lavender, 4 Garlic chives (Allium tuberosum), 5 Yarrow, 6 Lemon balm (Melissa officinais), 7 Sage, 8 French tarragon (Artemisia dracunculus var. sativus), 9 Mint. In a herb spiral, grow all the herbs you need for everyday cooking. The top of the herb spiral is a dry spot, which is ideal for the Mediterranean herbs such as lavender, sage, rosemary, or thyme. The middle circle of the spiral inhabits herbs that like slight moisture and requires the sun to thrive– cilantro, dill, lemon balm, lemon grass or chives. In the lower side, plant herbs that tolerate evenly moist soils and some shade such as mint, basil or parsley. 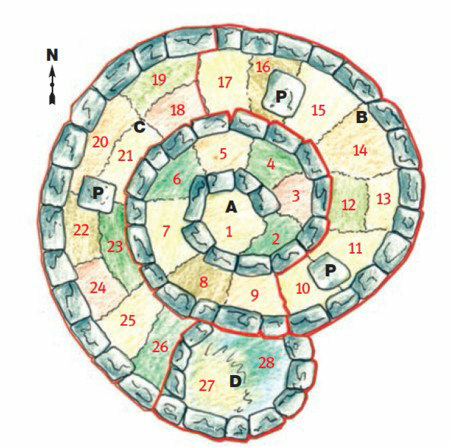 According to the plan 2, at the time of filling the soil in your spiral herb garden, bear in mind that this should be ideally divided into the four zones, each of which fades into the next without the continuity to give a different environment to your plants. The area which is marked as A is on top of the spiral – Here you can grow Mediterranean or tropical herbs– Fill it with a light and loamy soil with the slight amount of sand. In the second turn of the spiral, which is marked as B – Fill it with the soil that has some clay, also add a lot of compost to lighten it. The lowest curve of the spiral, which is C– Fill it with rich potting soil and plenty of aged manure. If you have not made a small water pond, then last is the swampy area D– Here add nutrient-rich soil so that you can grow here the plants that love wet soils. Rosemary (1), lavender (2), hyssop (3), Roman chamomile (4), sage (5), Oregano (6), savory (7), thyme (8), rui or (fake curry plant) helichrysum italicum (9). Rocket (10), nasturtium (11), tarragon (or tarragon) (12), cilantro (13) Bishop’s weed (14), calendula (15), Marjoram (16 ), ginger (17). Lemon balm (18), parsley (can not be close to chives), Bee balm (19) dill (20), garlic (21), chervil (22), chive (23), marshmallow (24), mint (25). Meadowsweet (26), veronica beccabunga (27), watercress (28). P = Stones to rest the feet. If you are making a pond, ensure the pond is facing North in Northern hemisphere and South in Southern hemisphere to reduce the evaporation of water. Herbs that grow very tall, spread or expand in width should not be planted in the spiral herb garden because as they may suffocate the other plants. Herbs like lovage, mint, borage, horseradish, artemisia, wormwood, and tansy or those that can become invasive, must be planted with care. 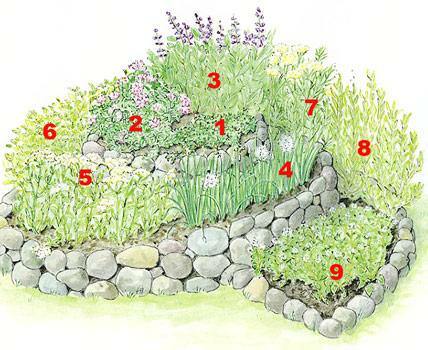 Plant the herb spiral in a way so that the tall plants will grow in the back. Otherwise, they will create the shade for the growing below in the spiral. Also, remember, that some herbs like mint are invasive and tend to spread. Therefore, it is better to plant them in a recessed bucket without a bottom. 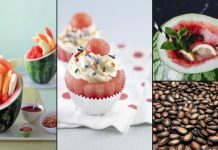 With the herbs, you can also grow salad greens and edible flowers. If you like, you can also grow flowers and other ornamental plants in your spiral herb garden. Gabions, ie stones in metal grids.